MiC Roundtable: OK media, what’s the plan? As part of our roundtable series, media experts weigh-in on investments in direct-to-consumer tech, brand planning and the age of transparency. This article appears in the May/June 2018 issue of strategy. If you want to know how media planning is changing, talk to those leading the charge. 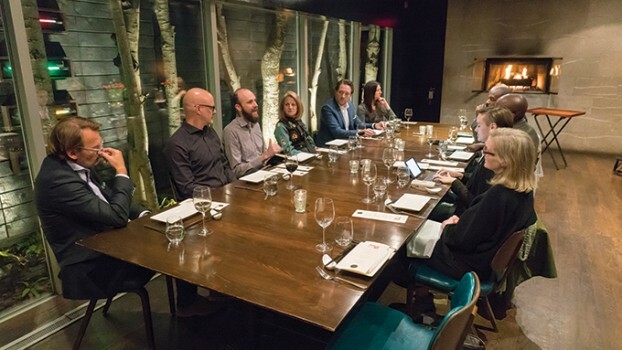 As part of strategy and Media in Canada’s ongoing series of industry roundtables, we check in with media experts on how strategies are evolving as clients ponder new tech and what the industry needs to deliver stronger ROI. At the dinner roundtable was Media Experts’ Richard Ivey; Vizeum’s Adrian Capiobianco; The Media Kitchen’s Jodi Peacock; Mindshare’s Devon MacDonald; and MediaCom’s Kevin Johnson. When you’re building plans, what are clients asking for more and more? Where’s the change? Jodi Peacock, The Media Kitchen: Since last year, it’s been about being able to tie back to something you’ve done. That’s just easier in digital. Clients are saying, “We know they went into a Walmart, but did they go into the shoe section?” It’s now about digital attribution and listening for signals. We need to understand where people are in their path to purchase. Richard Ivey, Media Experts: We’ve seen a focus on proprietary research. Every time there’s a campaign, there’s a study to see what worked and what didn’t. The digital players can say, “You’re going to spend money with us and we’ll show you that it worked.” The traditional media aren’t doing that enough. Sometimes you have to take those studies with a grain of salt, but I like the direction that it’s taking the industry. Peacock: The definition of efficiency is changing too. Efficient doesn’t mean cheap. It means “productive,” getting the most value out of your money. In our world, programmatic means the lowest dollar. The brand safety issues of last year shed a light on that. I don’t have any clients that would go straight to open exchanges and lowest CPM now. You would have seen that a few years ago for the sake of efficiency. Adrian Capobianco, Vizeum: Some clients are focused on getting the lowest cost per [consumer], and some are about the best cost for the best audience. That might mean spending more. It depends on what their business drivers are. Are brands putting more money towards direct-to-consumer tech? Devon MacDonald, Mindshare: Voice is getting bigger. I think that’s going to be the main interface for people to use technology. We communicate amongst ourselves most effectively with voice. Whether that’s in your car or at home, they’re all getting better. We’re educating clients on what that means for media. And are AR and VR still on the radar? Ivey: Brands are waiting for the killer app that’s actually going to make it work. People talk about it, but there hasn’t been a practical use for it. It’s likely to start somewhere other than advertising. It seems great, we can sell an ad, but the consumer has to want to engage with it. MacDonald: I disagree a little bit. I think native AR in a phone allows for a branded experience. We saw it manifest first in Snapchat. Have the troubles at Google and Facebook shaken confidence in online spending? MacDonald: It’s about consumer trust. People are more aware of data collection and of what’s happening when people are served ads or not. This is going to become a critical education point, which is why advertisers or brands need access to that information. Typically, Google and Facebook have acted like walled gardens. They don’t like sharing. Peacock: The walled gardens are walled universes – Facebook versus Google versus the entire open web. It’s not that hard for an advertiser to actually buy that way. Kevin Johnson, Mediacom: But another five years will bring another revolution. And if we know one thing, it’s that no organization is safe if they don’t evolve and change with the times. We have all used the Kodak analogy. But how many other organizations in the last five years have dissolved because they couldn’t evolve? No one is protected from that. I don’t care how big you are. Anything could happen. Part two of the roundtable will follow tomorrow.